Laurie Allen, Director for Digital Scholarship at Penn Libraries, and Penn's Price Lab for Digital Humanities are helping to immortalize the public art and history project. Who better to design a monument than a city's own residents? Monument Lab: A Public Art and History Project, running from September 16 to November 19, has helped showcase 20 artists' groundbreaking works based off their own experiences and inspirations in the city of brotherly love. Penn has played a crucial role in the project, as scholars and experts from a variety of fields are lending their knowledge and resources to the collective. Monument ideas are not limited to professional artists—anyone from Philly, of any age group, is encouraged to contribute their plans. That's where Laurie Allen, Director for Digital Scholarship at Penn Libraries and Director of Research for Monument Lab, comes in. Her team has pioneered a digital archival system to chart Philadelphians’ monument wish list with the help of Penn's Price Lab for Digital Humanities. Penn's involvement doesn't end there. Ken Lum, Professor and Chair of PennDesign’s Fine Arts Department, and Paul Farber, C'05, of Urban Studies at Penn, who also serves as Managing Director of the Penn Program in the Environmental Humanities, are co-curators of the project with A. Will Brown of the Museum of Contemporary Art in Cleveland. "Monument Lab emerged out of classroom conversations around issues of history, memory, and the role of social justice in public art. Our students and colleagues at Penn have not only nourished the development of this citywide initiative, but also helped to push its quality, reach, and rigor," says Farber. 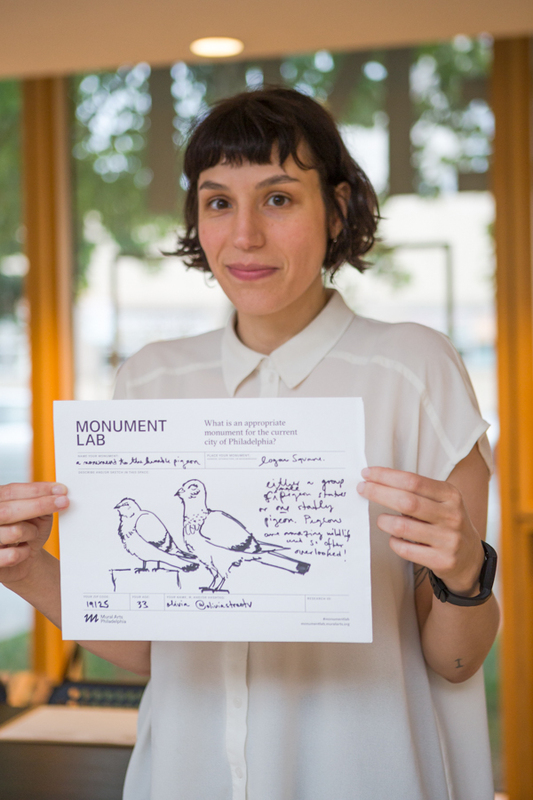 "As an interdisciplinary initiative, Monument Lab seeks to collectively reflect on the monuments we have inherited, unearth the next generation of monuments, and work to forge connections between civic practice and critical inquiry." Below, we speak with Allen about the research component of Monument Lab and how this system is allowing Philadelphians to shape how their city is immortalized.